I's introduced to this dish in 2009 by Sheena ,my friend. Unfortunately my mom never made this for us since i remember but i think i had this when we were in my grandma's house in karaikal during my early childhood . 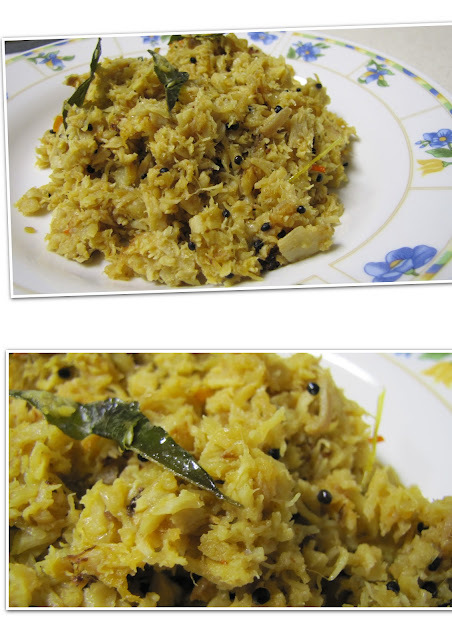 This recipe is from Sheena and she makes awesome sura puttu..
Green chilly -- chopped -- 2 no. Garlic (peeled)-- chopped --- 5 no. Boil the sura /shark for five minutes with salt and turmeric powder. U may do this pressure cooker also for one whistle. Shred the sura into tiny bits and pieces ,like puttu , once it's cooked. Next ,take a big wide kadai and add the oil. Do the tempering by adding mustard seeds and curry leaves. Add the urad dal annd fry until it turns golden. Then add the GG paste and suate well. Do not burn it. Drop the chopped onions at this stage and scald well. Mix the chopped garlic ,green chilly and combine well. Cook this mixture well enough for 5 minutes so that the garlic gets cooked. If u want it spicy like me ,u may add the optional ingredient ,red chilly powder now and combine well. Now add the shredded sura and give it a good maix. make sure the masala gets coated everywhere. Check the salt and if it's insufficient u may very well go ahead add it according to ur taste.. Scald well ,Switch off and serve..